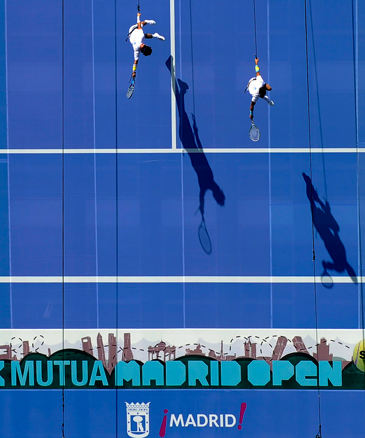 Above all, Madrid serves as an example of what the sport can become in this new age — a Europeanized (and better version) of a US Open Series event. Tennis has always stood on the shoulders of the many cities that host it, but quite often, standardized tournament branding fails to effectively represent each location’s diverse nature. Hopefully, with its constant attempts to break the mold, Madrid will inspire its fellow tournaments to modernize and engage the global audience. 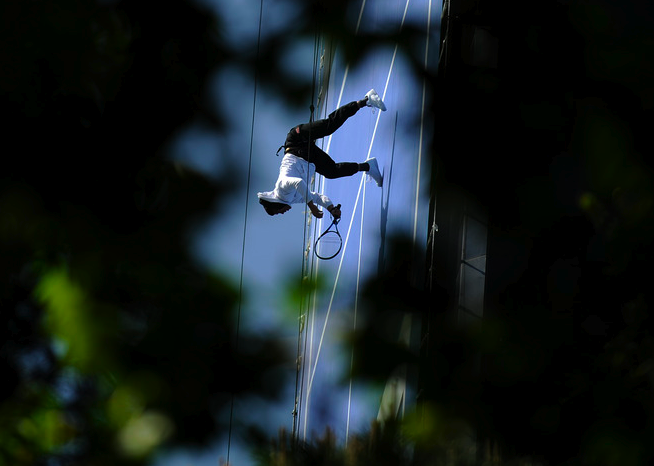 After the jump: More high-flying pics from Madrid’s on-the-wall acro-tizing. Lindsay Sakraida is a freelance writer who, in addition to tennis, has covered fashion, film, photography, shopping, and music. Check out her musings on Twitter at @LinTENNIS (tennis-related) or@LinSakraida (generally non-tennis related, but sometimes she can’t help herself). 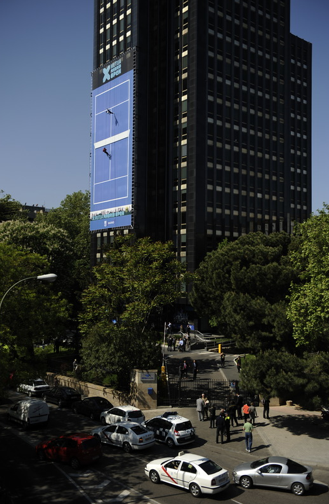 This entry was posted on April 29, 2011 at 1:46 pm and is filed under advertising, madrid, rafael nadal, tennis, tournaments, websites. You can follow any responses to this entry through the RSS 2.0 feed. You can leave a response, or trackback from your own site. I can’t believe you have seriously fallen for it! These are all superficial gimmicks, that are not even working. Models can’t run and often halt game with slowness and clumsiness. Website is wonky and unreadable. Blue clay obsession is only due to main sponsor’s signature color, but the dye alters clay properties, as tested on two practice courts. At the same time, the essentials are missing: not enough practice courts, too small locker rooms and players lounge (as opposed to gigantic executive offices), no landscaping around the site to protect from swirling winds, and the most importantly, main courts are “raw”, unsettled, with irregular bounces.